Polly on the beach just 10-days post-op. Limpy walks, but the leg looks amazing! It’s been almost 3 weeks since Polly had the TPLO operation on her leg, so I figured this would be a good time to update everyone on her progress. Plus we finally (finally!) figured out what we’re going to do in July so I wanted to share that too. Since we have several doggie owners who follow the blog & perhaps folks who will go through this surgery in the future, I’m going to go into quite a bit of detail about her recovery process here. For those not interested in the nitty gritty (including poo!) feel free to skip this post. For the rest of you, here goes…. 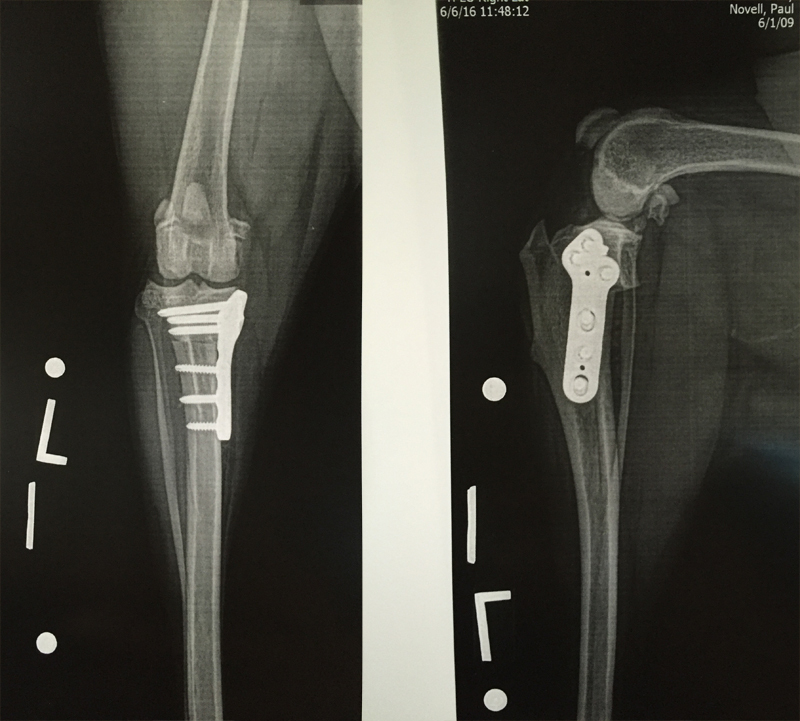 Our primary good news is that Polly’s new bionic leg looks absolutely amazing. TPLO is a very invasive surgery and I’d read horror stories of recovery online which probably made me worry waaaay more than necessary. I’d seen online pictures showing scars that went across the full length of the leg, deep purple/red bruising, swelling, stitches that split open and infection. Honestly I was prepared for the very worst. In Polly’s case I’m incredibly relieved to say that NONE of this happened! I believe that finding the right surgeon was KEY and I can honestly say we are beyond amazed at how well the leg has healed. Dr. Acker made a very small incision (only a few inches long) and Polly had literally ZERO swelling and only one teeny, tiny barely visible bruise. If I hadn’t seen the X-rays which showed the plate and the enormous screws in her leg, I would never have believed she’d had such major surgery. It’s a total testament to the surgeon’s skill & efficiency that the scar/bruising was so minimal. Honestly, we are astonished. Post-Op pictures Day 1, Day 4 and Day 7. Just a small scar and no swelling or bruising. Click for larger size. The first week of TPLO recovery is perhaps one of the hardest. The dog must be kept at rest, only taken out to do their business and cannot run, jump or do ANY stairs. Some dogs start to use the leg right away, but others don’t use it (at all) for several weeks. You DO want to see “toe touching” (= toe touches the ground), but you want to keep use to a minimum and you DON’T want to see ANY split, leaking or bad smell from the wound. Some bruising and swelling is also normal (although we saw neither, as I mentioned above). In Polly’s case, the she started toe-touching the very first day after surgery. On day 3/4 she was tentatively putting down the leg and using it (very wobbly, very unsteady) for a few steps every now and then. However she did not properly walk on the leg the entire first week and spent most of her time hopping around on 3-legs. For meds she had a pain patch (Fentanyl) on her rear “good” leg and was on oral antibiotics and an anti-inflammatory. The pain patch came off on day 5, while the antibiotics & NSAID continued for a few more days. The meds were fine and she showed zero discomfort after she came off them (which was a big relief). During the entire first week we only took her out for quick ~5-min outings, and monitored her inside the rig to make sure she was resting & not moving around excessively or jumping on any furniture. The only major problem we encountered in the first week was poo, and it was all related to the anesthesia & post-op meds. It took around 3 days post-op before she poo’d and she didn’t get back to completely normal poo’s until 2 days after the antibiotics were done. Fellow dog owners will understand why I mention this and why we monitored it closely! The second week post-op you can start to walk the dog (slow, controlled 5-10 min walks, 3-4 times per day), but you still cannot allow doggie to run, jump or do any stairs. Polly started using the leg slightly more this week (almost every time we went out), although the majority of her walking was still 3-legged hops. The leg was still wobbly and her 4-legged walking was very slow and with a very marked limp. All walks were kept short and she was monitored inside the rig to make sure she was resting and not moving around too much around or jumping. She went to the vet end of week 2 for an incision check (all perfect). She received NO MEDS this entire time and showed NO signs of discomfort or pain. By the third week most dogs will start using the leg more regularly and you can start slowly increasing walk time (up to 15-20 mins, 3-4 times per day) outside. Walking stimulates bone growth and fusion, so it’s important to do, but it also can’t be overdone since the “new” bone is still very weak. The dog must still be kept calm, with NO running, jumping or stairs. With Polly this has been the week we’ve seen the biggest improvement. Over the past few days (15-17 days post-op) she has started to use the leg every time she walks. She’s no longer “wobbly” and she has only a slight limp, but she is definitely still weak on that side and she favors the other leg whenever she stops or rests. The muscles in the bionic leg are starting to develop, but there’s still a measurable difference between her two rear legs in terms of muscle size. Overall however, I would say that she’s almost looking “normal” when she walks which is pretty impressive. We’re still doing slow, controlled outings, but increasing her walks ever so slightly with each outing. How Do You Handle NO STAIRS In An RV??? Perhaps the biggest difficulty we’ve faced these past 3 weeks is that Polly is NOT allowed to do any stairs. When you live in an RV that’s something you can’t avoid, so Paul has resorted to carrying Polly in/out of the rig for each of the 3-4 times we walk her per day. That means he’s doing full ~50-lb squats ~12-16 times per day (2 squats each time you move her) = not exactly power-lifting, but tiring nonetheless. I joked that I probably should have taken a “before” and “after” picture of him because I reckon this is going to buff him up and hey…who doesn’t like a buff hubby? Oh, and me? I managed to tweak my back pretty badly on day 1 so I’ve had to abstain completely from anymore doggie-lifting. Coincidence or just because I want to admire hubby doing lifts? We’ll never know…..
Hip Lift Harness: I’ve seen many doggie owners use a “hip lift harness” to help take weight off the rear legs. It’s basically just a wrap that goes underneath the belly of the dog (around the hips) with a handle to lift upwards. It’s especially useful for heavier dogs that can’t be lifted directly. You can buy these online or you can just cut-up two sides of a large canvas bag (which is what we did) or you can even just use a big towel. In Polly’s case we tried it out, but it was just too awkward and doggie wasn’t comfortable with it. Besides she was hopping around on 3 legs on her own most of the time, so we felt we didn’t need it. Stair Ramp: Some owners buy a stair ramp (much like this one) to help doggie get in/out of places. The ramps can be a bit tricky to use on narrow RV steps, especially if the dog is wobbly on their legs, but they can certainly help larger dogs and geriatric dogs who can no longer do stairs that well. With Polly we just felt it was easier and safer to carry her in/out of the rig. Apart from the RV stairs, the other thing you have to be careful about inside an RV are the slippery floors and all the various furniture items which doggie might jump onto. For dogs who’ve undergone TPLO surgery it’s important to forcibly limit their activity, especially the first few weeks and there can be NO RUNNING and absolutely NO JUMPING. So, you have to do what you need to do to avoid this. Polly has been “place trained”. This is her spot. This is how we block our couch when we leave. Other dogs may need more rigorous blocking. We have yoga mats on the floor for grip. You can see Polly in her resting place by the dining room table. Create a Comfortable, Safe Rest Area: Many folks chose to crate their dogs, especially the first 2 weeks after surgery. Other folks will corner off parts of their RV (e.g. with baby gates, indoor panels or X-pen units) to create a comfy, secure area for rest. Thankfully Polly has been “place-trained” which means she will rest in one place when we ask her to, so we’ve not needed to do anything special. Her “spot” is underneath the dining room table and she’ll happily stay there the entire time we’re inside the RV. Block Access to Furniture/Beds: If you’re anything like us you like to have your dog next to you in the sofa or in bed with you at night. So, if your dog is a “jumper” all those areas have to be blocked and/or doggie has to be crated/controlled so that he/she doesn’t have access to them. Polly has been trained not to jump onto (or off) anything unless asked, so we’ve been able to manage this easily with no modifications. The only time she’ll jump by herself is when we leave the RV (we’ve always allowed her to jump onto the couch when we’re gone), so on the rare occasions we leave her alone we place obstacles (tables, chairs) in the way to prevent this. We also close off the back bedroom, just in case. This has worked perfectly for us. Cover Up Slippery Floors: Dogs can be pretty wobbly post-surgery and you definitely don’t want them slipping around on the “new” leg. We have tile in the living room which is fairly slippy so we put down yoga mats to provide grip as Polly walks around. It’s encouraged us to do more yoga (more buffing?) and it’s worked perfectly for the dog! What About A Head-Cone/E-Collar?? Many of you might wonder why Polly is not wearing an E-collar in any of her photos. Well the easy answer is that the surgeon gave her internal stitches, so she didn’t need one!! In fact, he said we didn’t need to worry about the wound at all unless we saw it leaking or she was licking it excessively. Many vets will require head cones after surgery, so it just depends how the surgery is done. If your dog needs a cone I highly recommend buying something like a Comfy Cone instead of the standard plastic torture device that you get at the vet. It’s much easier on the dog. Thankfully we haven’t needed ours for Polly. I’ve always been a fan of good supplements and doing whatever you can at home to help the natural healing process, so this has been no different. Supplements: For the first week (while doggie was on antibiotics) I used probiotics to help replenish the good bacteria in her system between doses. We also put her back on her regular Glucosamine supplement (we use Cosequin) and gave her fish oil every few days. All are safe supplements and can only help long-term. Home Rehab: I didn’t want to wait for the “official” rehab process to start helping Polly, so I found this handy, free online post-TPLO rehab booklet (no affiliation, by the way) which we’ve been following since day 1. Note that their website can be slightly annoying since it bombards you with e-mails to buy their glucosamine supplement if you sign-up, but both their booklet and their online videos have been great, and I’ve found the free info very useful indeed. We started week 1 with daily range-of-motion movements and massage, and we’ve just (this week) started incorporating sit-to-stand exercises. It’s been really helpful to have a written plan to follow. Light Therapy: We’ve continued with daily light therapy using the Tendlite Pen I bought before she got injured. I have no idea if it’s helping, but I figured it certainly can’t hurt and doggie seems to enjoys the therapy. So, WHERE Are We Going Next??? First I want to thank everyone for their offers, tips and support regarding Polly’s rehab options. We got lots of excellent tips on rehab spots, plus several wonderfully generous offers of places to stay. We considered Portland, Eugene, several spots in Seattle and (even) Michigan, but after much calling around and mulling over the problem we decided to go back to where Polly had her surgery done in Sun Valley, ID. Firstly can get there pretty quickly and start Polly’s rehab ASAP (this was important to us). Secondly we were were able (by some frikkin’ miracle) to finagle the last monthly site in the one and only RV park there. Thirdly the RV park is literally walking distance (!) to the doggie rehab center, which will make life super easy. And fourthly, by going back to the “source” we can get all of Polly’s follow-up (8-week X-rays and such) done in the same place and with the same vet who did her surgery. This simplifies a lot of things all at once. Lastly, Sun Valley sits at around 6,000 ft elevation and has high mountains & forests all-around which should (hopefully) make it decent as far as summer weather goes, with the ability to easily escape to higher altitude if it’s too hot at our RV site. It’s going to be a new area for us too, which is always a bonus. We’re going to start her rehab the day after we arrive which will be only a few days after we leave Cape D (end of June). Finally our July plans are fixed, and hopefully (all 12 paws and 20 fingers crossed) this will be the last plan change this summer! That wraps up Polly’s 3-week progress. For any questions on TPLO or TPLO recovery (or anything else that comes to mind), feel free to fire away below! So happy to hear Polly is healing well. The photo of Paul carrying her reminds me of Angel’s post-surgery, but Hector had to carry Angel while wearing a boot for a torn tendon in his heel! He is such a great dad. You are wise to do rehab and follow-up in the same facility and the same veterinarian. I believe that will make a huge difference. And I’ve heard Sun Valley is beautiful – this will be a great time of year for alpine flowers too. Enjoy! I’m actually quite excited to get to Idaho both for the rehab, for the mountains and to experience a totally new (for us) place. We’re feeling very happy all-around with our decision. That is excellent that Polly’s recovery is going so well, sounds like you and Paul definitely have it under control and are such great loving doggie parents. Wonderful that you will be able to take her for rehab in Sun Valley with her vet! Have a great time exploring a new area and best of luck to Polly for her continued rehab. Yes, it all worked out quite beautifully I must say. Can’t quite believe we were able to get an RV site there, especially in the high season of July. In fact the lady laughed at us when I first called to ask, but then called back again later in the day to say she’d be able to fit us in after all! I think it was meant to be. Sooo happy to hear about Polly’s progress. Glad it all worked out and can’t wait to see what ID holds for you. We’re hoping to explore this area later this summer. Hopefully. This will actually be our first extended visit to Idaho. We’ve passed through many times over the years, but mostly around I-84 and Boise (with a few other stops along the way). It’ll be nice to explore the state in a little more depth off the main highway. That’s such good news! I’m so glad Polly is recovering well. Ya, the stairs, Torrey only weighs 34 pounds but we were getting tired of hauling her in and out. But…ya gotta do what ya gotta do. We have spent time in Sun Valley when we did art shows there. We stayed at the one and only RV park too. It’s small, real small. We could have passed coffee to the neighbor. There is however a nice walking path right there. If you want to escape the heat, drive up the canyon. It is very pretty there. And cooler. There is a national forest campground at the mouth of the canyon. Not many sites, but it’s right on the river. If you go all the way through the canyon, you will be near a town called Mackey. There is free camping on the river there, just before you get to Mackey. But that is probably an hour and a half away. We boondocked over by Stanley too, which is closer to Sun Valley. Waaaaayyyyyy pretty over there, and lots of boondocking. The Sawtooth mountains are amazing. Excellent tips, thanks! Paul did quickly check out the RV park while he was there w/ Polly for the surgery and pretty much said exactly what you did…it’s a small park with tight sites. Ah well. It’ll be handy for the rehab center which is the main reason we’re there, and it’ll also be handy for town access. We’ll definitely be exploring some of the surrounding area, including the boondocking spots. If we end up having to stay more than 1 month for the rehab we’ll likely get out of the park and into nature. I’m looking forward to the mountains, for sure. Polly looks great and your plans for July seem like they really were meant to be! At least this time it won’t be the grueling 22 hour drive in two days for Paul. Totally!! I still can’t believe he did that whole round-trip drive in 2 days. This time we’ll do it together, just one way, and we’ll take a few days to get there. Should be much less stressful! So glad to hear that Polly is doing well. You definitely found the right surgeon, hard to believe how well her leg looked in the pictures. It will be interesting to hear how the rehab goes. From what we’ve seen of Polly I’m sure it will be fantastic. The rehab center there looks fantastic too. The vet in charge has been doing rehab for over 12 years and they cover everything you could imagine…hydrotherapy, gait analysis, acupuncture, laser therapy etc. I’m looking forward to it! Sun Valley sounds like the perfect place for all of you to spend time. You may already know this but the beautiful Sawtooth range is an easy drive north and definitely worth spending some time. There are some boondockiing sites along the Salmon River. Enjoy your time in Idaho. Great tips! I’m really, really looking forward to the Sawtooth Mountains since we haven’t explored that area at all. I’ve heard wonderful things. Serendipity for sure. It’s been a tumultuous Spring, but I’m hoping we’re past the worst and things are going to settle down a bit again. I’m happy July is fixed, at least….just in time too! Sun Valley is beautiful guys–we helped deliver a very expensive sheep wagon to Sun Valley one spring and got hit by a late snow storm. The cowboy had to go to town, rent a tractor, drive it down the highway, and plow snow so we could get the sheep wagon in place. You just might run into some celebrities there too! Goodness…I had no idea that area was so “fancy”. Think I might have to break out my brand new Keens. Oh, and so, so glad Polly is doing well!! I can’t begin to imagine how hard it must have been to keep her quiet–but then she is one well trained pooch! So thrilled to hear Polly is recovering so well.. and seems like plans for rehab lined perfectly up for you! Hooray! So great to see Polly looking so good after the ordeal. Same goes for you and the other paws. Have fun exploring ID and hope it’s all downhill from here! While we don’t have a dog, I found it quite interesting reading about Polly’s recovery. So glad to read she is doing so well:) Sounds like a smart plan to head to where she had the surgery, not to mention how nice the higher elevation will be in July:) Hope Paul’s back holds out. Make sure you are stretching it, Paul:) Hope your back is doing better, Nina. I wish Sun Valley was a teensie little bit higher (6,000 feet is still a bit too low for the heat of summer IMHO), but I’m looking forward to exploring the mountains and I’m happy we’ll have the chance to escape to higher elevations as needed. Oh, and I sure hope Paul’s back holds out too! Nina and Paul, We are so happy to hear how well Polly is doing. That is wonderful! You and Polly were in our prayers. I know your pain, having had many dogs (4) and cats (8) over the past 30+ yrs. We now have only two dogs. After the loss of our last four cats, we’ve decided to not adopt any more…maybe for now. It hurts too much. Can only imagine your joy knowing Polly and Taggart are doing well. They must be enjoying all the extra love and attention. The rehab center sounds perfect. As an acupuncturist I highly recommend acupuncture to speed up the healing process. It helps not only with pain and swelling but also with improving ROM. More prayers going your way. Thanks so much for your thoughts and prayers. I’m very interested in the acupuncture for Polly. I grew up with acupuncture (everyone used it in Asia when I was a kid) and it did WONDERS for Paul when he had his back injury a few years ago. We’re definitely going to give it a go. So glad to hear that Polly is doing so well and that you have such a great plan for her rehab. Will be fun for you guys to be in a new place to explore while Polly continues to heal. Hope your back feels better soon, Nina. Whew! I’m exhausted after reading that. I can’t imagine how Paul and Polly are feeling with all that lifting, etc. I am really happy to hear that Polly is doing so well. I’m also looking forward to seeing what Idaho looks like. Her leg looks really good, internal stitches are just the best. I can attest to that! I honestly didn’t know much about internal stitches before all this, but I agree they totally rock. We kept asking the vet “No cone? Really?”. It’s been soooo much easier without a cone. I grew up just over the hill from Sun Valley, so you will be in my old stomping grounds. It has really grown and developed in the past 50 years, but I’m sure you will love it there. Lots of beautiful scenery and awesome hiking. I remember all the stories you’ve told us about Arco. I’m hoping we get to drive over there to explore some more. We totally missed the nuclear facility that your father worked at last time we passed through. Nice to hear that Polly is recovering nicely. So glad to hear Polly is on the mend and doing well. Sun Valley looks like it could be a nice summer retreat. Really amazing recovery Nina. You obviously did a fabulous job of picking a surgeon for Polly. Don’t blame you at all for going back there for the rehab if only for the continuity but it sounds like a lot of other good reasons as well. Hope all goes swimmingly! I think it’s all worked out pretty well, considering. Couldn’t really have asked for a better plan. We’re looking forward to it. So glad Polly is mending well and she can do her therapy with the same place that completed her surgery. Sun Valley should be beautiful in July. Look forward to your posts on that area. It’ll be really fun to explore a new area. I’ve felt like we were in a bit of a holding pattern these last 2 months, but I think things are finally moving forward again. Should be all good! Glad to hear this all worked out so well! Enjoy Idaho while Polly is re-habbing. I am so glad things are working out for Polly. I understand everything you have gone through. We don’t have any kids so our dogs mean the world to us and we would do anything for them. We will happen to be in Sun Valley 7/23-26 on our way to the Cascade lake area and staying at The Meadows. I believe it is the only RV park I found in Sun Valley. I hope we will get a chance to finally meet. I really enjoy reading your blog and use it frequently as a resource for places to visit and stay. I hope the rehab goes as easily and as perfect as everything has so far. Yes that’s the one and only RV park in the area. We should definitely still be there when you arrive! So glad to see everyone on the mend! (Taggart too, I presume?) I can’t help but wonder every time I see a photo of Polly, what she thinks about her “leg wax.” The Libra in me wants to shave the other one to match. LOL! Sounds like Idaho is a win all the way around. Keep up the good healing! P.S. I get the whole symmetry thing. Totally! You have had some many things happening lately and every time I read about a new one I think about how I would handle it. We had 3 dogs. 2 dachshunds and a beautiful golden doodle who we just put down in February. I love hearing about Polly. A big decision on your part and you are right.. It was scary. You read so many results that it can drive you crazy. I am so happy that eveything worked out and that she is healing wonderfully! That is such a blessing. Also the fact that you got the last site. Good luck next month with rehab and your new explorations! I will keep reading to see how everything goes. Awww…what lovely doggies! I’m so very sorry you had to say goodbye to your doodle in Feb. Thats another decision which is so very, very hard to make. And of course I know it’ll come for us one day too. I really wish our furry family members lived longer. It’s so hard. Wish you the best of luck in your travel plans and travels! I know your dogs and you will love it if you get out here. Hi Nina. I haven’t posted before, but have been a big fan of Wheeling It since my wife and I bought our own “beast” a few years a ago. Also feel a kindred connection because she, like Paul, is Cuban and from Miami–a south Miami Red Road girl. I’m very glad to read that Polly is recovering nicely. We’ve dealt with 3 ACL’s, two dogs and one cat, so I get it. Another Cuban on the road!! We’ve not met many, so Paul will be excited to hear about your gal (hope that didn’t come out sounding too weird LOL). Pauls mom lives right around that same Red Road area, on 57th and 48th so they’ve got the same Miami roots too. Small world! And three ACLs!! Wow! Including your cat too. I totally commiserate. That’s a lot of forced rest and rehab. I can’t even imagine how you handled it with the kitty? Great to hear the weather is so nice in Sun Valley. I did a bit of weather Google before we booked and it looked like mid-80’s was the highs for summer, which is totally do-able. Cheers also for the other tips too! Maybe we’ll see ya down the road! Small world indeed! Nori’s family home is about 3 blocks north, just before 57th and 45th intersection. She’s visiting now, actually. Ask Paul if he or his parents knew any of the Rubi family. Nori is UM grad class of ’82, so we’re a few years older than you and Paul, but her brother Julio is about Paul’s age. Very cool! Wow, that was a very complex, and very interesting post! I hope I remember where it is if we ever need to manage something like that for our dog. However, one of the reasons we picked Mattie had to do with the fact that she is 15 pounds and we knew that no matter how we aged, or how she aged, we could still carry her up the steps! Idaho is a wonderful place in so many ways. I look forward to some of your day trips and interesting travels. I did soil survey in the state, mostly north of the Clearwater River, but also around Idaho Falls, Craters of the Moon, Soda Springs, and Challis and Salmon. I have precious memories of my 30 plus years in Idaho, but not so precious memories of the politics there. Ah well. Sun Valley is a whole different ball game than much of the state and you should have a wonderful time there. Don’t miss Redfish Lake by the way, it is gorgeous. So happy to hear! We have a Mastiff- who’s 3 mos post op of her 2nd TPLO surgery in less than a year. Healing well- no more knees to blow! Can’t carry her though LOL. So glad to hear that Polly has rocked her recovery and that you now can begin to make plans again. Here’s to complete recovery soon and enjoying your time in Idaho. Great news! And a very good choice for parking it. Polly is going to absolutely love Stanley and Redfish lake if you get up there. If, on leaving, you trek to the east I highly recommend a night stay at Heald’s Haven, about 6 miles south of Salmon. So peaceful and Connie is really good people. Happy to hear the good news. Sun Valley is a fun place to hang out, some great bike trails in the area. The Sawtooth Mountains have great hiking opportunities. If you get a chance Redfish is a wonderful area to explore. There are also several fun restaurants / brew pubs in Ketchum ID!! If you are still in the area after the 1 month stay, we camped in the North Fork NFS, campground west of Ketchum, small campground but there were several sites that could accommodate larger rigs, close to the highway, but the noise wasn’t too bad and was so much nicer than being in town. Paul already told me about the brewpub in Ketchum….a definite point in the towns favor! Looking forward to exploring the area. Hey you guys are close to Canada, you should make a trip up to the Kootenays, come up through Nelson, Cranbrook, Kimberley, Fairmont, Invermere, Golden do a trip to Lake Louise, and Banff. we have a couple places you can always stay for free, though they are off grid, but the one is on a creek and very private. the USD is in a fantastic position for that. this will put a damper on our trip to Florida for sure. Oh gosh I’m so sorry for all your troubles! The sling is a good idea and will definitely help with a larger dog. And if you can make it to Sun Valley I can certainly recommend that facility. I think Dr.Acker is one of the best in the country, and we’ve been thrilled with Polly’s rehab. It’s a long road, but you’ll get there. My best wishes to you! when she gallops or bounces in place she just avoids using the leg, not that she is injured, she just won’t use it, verification. The good news is that Polly is now completely limp-free and has been for many months! My 10 year old dog is 10 days past her TPLO surgery. I have relied a lot on the internet for guidance. I just wanted to say that I am so grateful and heartened by people like you who have taken the time to write about your experience with the surgery. I am so please that Polly is doing so well. Thank you so much for your selfless act of sharing your knowledge and Polly’s “adventure”. She’s a beauty and lucky to have such good caretakers. People like you are the thread that make the tapestry of life so blessed.